There is an online physics-based game called Demolition City. The game looks deceptively simple – almost Pac-Man-like – that one guesses it would be a snap for most anyone working at North American Dismantling Corporation (NADC), Lapeer, Mich. Whether the game or real life, the concept is the same: Know where the pivot points are in a structure that can bring it down most efficiently. Specializing in heavy industrial demolition and strip out, North American Dismantling bids work throughout the United States and Canada. The company boasts expertise in engineering, environmental assessment, remediation and specialty construction, while maintaining its long tradition of being considered an industry leader in demolition. 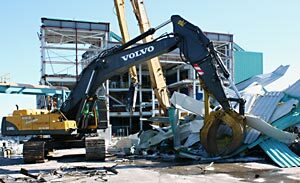 A current demolition challenge for the company is a massive one-million square-foot former GM Saginaw Malleable Iron foundry facility located in Saginaw, Mich.
A Volvo EC460 hydraulic excavator uses a grapple to process material for recycling. Located on an approximate 275-acre site, the operation opened in 1917 and had supplied metal sand-mold castings to the automotive market until it was permanently closed in June 2007. The complex includes a nine-story building and a single-story plant with 30-foot ceilings. There are basements, pits, and tunnels to contend with. Additional buildings, such as employee locker rooms, maintenance building, and a recycled water treatment facility are located adjacent to the main facility. Other storage buildings and utility sheds, such as: the oil storage shed, light non-aqueous phase liquids pump and treatment shed, butler buildings, and malleable substation are also located on the site. The $15 million project has been commissioned by Motors Liquidation Company (formerly General Motors), Detroit. NADC began working at the facility in November 2009 and expects to be finished by November 2010. 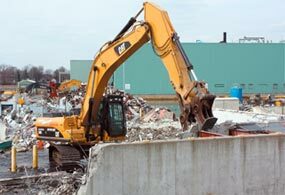 The company is responsible for demolition and removal of everything down to the concrete building pad. NADC currently has about 40 workers on the site and anticipates nearly doubling the project workforce. Being aware the possibility of contamination that would influence the demolition and disposal procedures, General Motors had a Facility Environmental Assessment prepared in 2007. 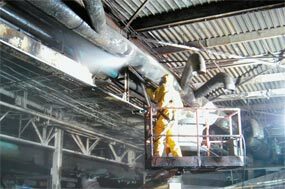 This FEA indicated extensive PCB contamination throughout the plant—including dust, sludge, water and PCBs trapped between layers of paint on the building structures. Added to the PCB contamination were heavy metals, universal waste and ACM, which all needed to be addressed.The environmental issues are extensive. Prior to 1978 Polychlorinated biphenyls (PCBs) were used in the manufacturing process. During that time, PCBs seemed like the good way to go. Consider that the commercial utility of PCBs was based largely on their chemical stability, including low flammability and desirable physical properties, including electrical insulating properties and as a “safer” cooling and insulation fluid. Think about it… the years of commercial PCB mixtures used, within a lead-painted structure filled with asbestos-clad systems made for a toxic nightmare. It was a nightmare that NADC, with the help of EQIS, needed to tackle, all in accordance with EPA requirements. Storm sewers have been sealed off. All water used in cleaning will be captured. The dust and debris will be vacuumed up. 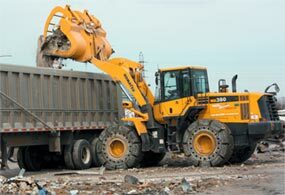 Loading debris with a 380 Komatsu front-end loader. “We wrote a comprehensive self-implementing testing plan that was approved by the EPA, before we even started,” Clark says. “We’re quite proud of our plan for this site. It was developed and will perform extensive pre-cleaning and post-cleaning sampling to delineate the extent of the PCB contamination.. Everything will be cleaned, tested (if applicable), dismantled and hauled off-site for recycling or disposal in a TSCA landfill.” NADC anticipates that 95 percent of the steel and other materials will be cleaned, tested, and recycled. National Environmental Group, Flint, Mich., is the NADC subcontractor responsible for the asbestos and lead abatement and removal. After EQIS and National Environmental have finished their phase of the project, North American Dismantling Corporation will begin the demolition and processing of an expected 20,000 tons of ferrous and non-ferrous materials. 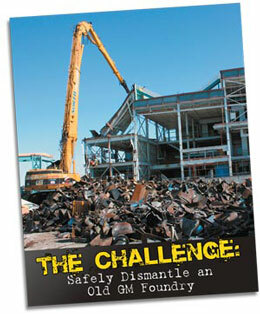 Controlled demolition of concrete structures using a CAT 330DL excavator with a concrete pulverizer. NADC will utilize a fleet of Caterpillar and Volvo hydraulic excavators, including a Cat 385C L Hydraulic Excavator with a high-reach boom, for the tear down. Most of the excavators are equipped with LaBounty shears. LaBounty is based out of Two Harbors, Minn., and is owned by Stanley Tools. Additionally, a number of NADC-owned Fuchs Material Handlers, a Komatsu loader, Bobcat skid-steer loaders, as well as water trucks and utility vehicles are being used on site.